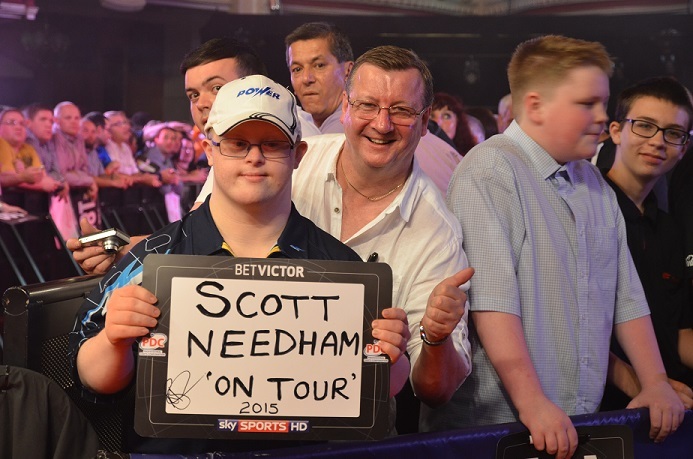 Might be some of you remember the pictue of Scott Needham which I published during the World Matchplay? Well - there is a backstory to this which Dr. Patrick Chaplin published in his DDN last December! During 'An Evening with Phil Taylor' held in Stockport on 21st November 2014 my son Scott was invited to play darts against Phil 'The Power' Taylor, thanks to the generosity of another guest, Brian O'Hare, who gave Scott his ticket he had won from the select few that were given out. Scott was fourth on the list to play and when the MC called out Scott's name, he walked to the oche, to the sound of the crowd applauding, to meet 'The Power.' The MC explained to the fans that the match would be played to Scott's rules. This meant that Phil played the regular 501 and Scott 301 with no double finish needed for Scott, and if Scott scored a bullseye at any time during the game, he would win the game outright. After a couple of rounds with Phil throwing in the hundreds, Scott lined up his throw. His first dart hit a single 19 and then his second dart hit the bullseye and the MC called it "Game Shot and the Match to Scott Needham" - Game Over - Scott had won! Phil was fantastic in congratulating Scott on his winning achievement and said, "Well done Scott." The crowd was in raptures. I was so proud of what Scott had achieved. He really tries to concentrate, which is not easy, especially because he has nystagmus. You couldn't have written the script any better. 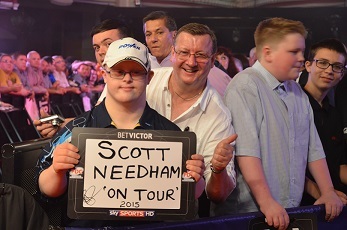 Stuart went on to explain: Last year, Scott was made an honorary member of the Stockport College Darts Academy. We try to attend at least once a week to one of the practice sessions. 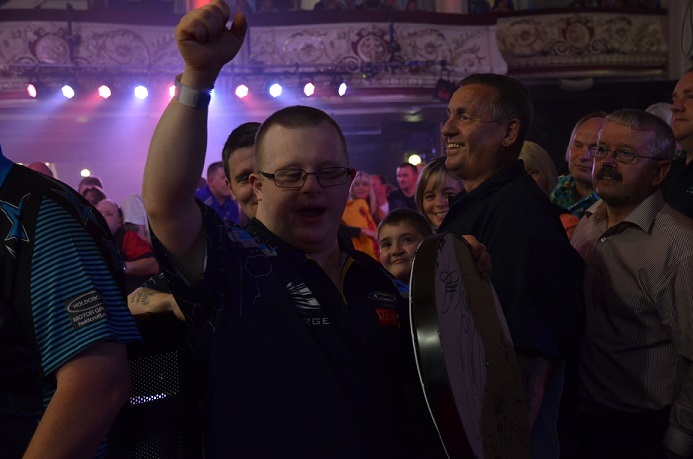 Early this year, the darts coach at the Academy Paul McDonagh set Scott a challenge to see if he could finish fifty games before the end of July by hitting a centre bull when he plays against the other academy members playing to 'Scott's Rules.' Scott achieved this with three weeks to spare. After the challenge games, Phil also kindly presented Scott with the trophy he won by winning the fifty games of darts on the Bulls Eye finish challenge. There is only one thing left to say: of course Scott Needham returned from the World Matchplay with a signed dartboard which Phil Taylor handed to him after his win over Andy Hamilton.